Rauchway draws our attention to a topic that frequently gets short shrift in the history books, possibly because the subject is difficult for non-professionals to understand. He identifies the central importance of Roosevelt’s break from the gold standard. That move helped to establish economic recovery at home and post-war prosperity abroad. Adherence to old-fashioned economic orthodoxies associated with the gold standard left nations poorly prepared to deal with the challenges of depression and war. Rauchway’s focus on gold helps us to appreciate an aspect of the New Deal’s economic success that has not received adequate attention in many historical treatments. When describing gains in productivity and employment, historians often point to the New Deal’s initiatives in fiscal policy. They note that deficit spending created a variety of public works projects. The Civilian Conservation Corps and other alphabet agencies hired thousands of unemployed citizens. Those workers spent their paychecks on goods and services, pumping new energy into a previously moribund economy. But, as Rauchway shows, monetary policy also provided a major stimulus for economic recovery. Keynes, as well as some other economists and politicians, convinced Roosevelt that the gold standard left the nation in a straightjacket. A major loosening of the currency -- a boost in the money supply -- was difficult to achieve as long as Washington remained tied to gold. The gold standard left Americans caught up in a deflationary spiral. For instance, farmers became desperate because falling commodity prices left them with heavy debts. Banks threatened foreclosure. Farmers sought rising prices – an inflationary lift – to save their property. The move away from gold worked marvelously. Prices for corn, cotton and other commodities shot up. Economic growth in the U.S. averaged about 9% annually during Roosevelt’s first term. “It was the strongest four-year period of peacetime economic growth in the history of the United States,” writes Rauchway. Eric Rauchway’s prodigious labor in the archives reveals the backstory for important actions in the Roosevelt years. Rather than concentrate just on political decisions and their consequences, Rauchway’s gives readers an insider’s look at disagreements and negotiations that led to policy-making. He opens the door to some fascinating behind-the scenes political dramas. We see, for instance, that the influential banker, James Warburg, served as a financial adviser to FDR but later organized attacks. Warburg complained about the President’s moves away from gold and orthodox economic policies. Rauchway portrays FDR’s wealthy New York neighbor, Henry Morgenthau, Jr., in more positive light. Morgenthau is often identified as the author of a misguided recommendation to treat Germany harshly after the Second World War (he wanted to prevent a recurrence of German militarism). Rauchway points, instead, to Morgenthau’s numerous accomplishments in times of peace and war. As Secretary of the Treasury, Henry Morgenthau, Jr. played a central role in designing and financing the New Deal. Morgenthau gave U.S. foreign policy economic clout. He helped to create the Lend Lease program, which provided much-needed aid when the Nazis threated Britain. One of Morgenthau’s greatest achievements came near the end of the war, when he shepherded the Bretton Woods agreement through Congress. Rauchway identifies Bretton Woods’ relationship to the failed peace arrangement at Versailles after World War I. The international agreement worked out at Bretton Woods created a strong foundation for economic growth and global cooperation in the post-war era. Back in 1919, John Maynard Keynes emerged as an influential commentator on international affairs when he published a book that lambasted the peacemakers for their failures. In The Economic Consequences of the Peace Keynes maintained that the settlements after World War I would create economic ruin in Germany, fuel right-wing and left-wing radicalism, and threaten global peace and prosperity. Throughout the 1920s, 1930s and early 1940s, Keynes recommended economic planning and cooperation on a global scale. His leadership at the 1944 Bretton Woods conference led to the establishment of institutions that are vital today, such as the International Monetary Fund (IMF) and the World Bank. Harry Dexter White, who led the USA’s negotiations at Bretton Woods, dominated much of the decision-making. White rejected some of Keynes’s recommendations, but the overall agreement did help leaders to correct the mistakes of 1919. In many respects Bretton Woods represented the internationalization of ideals that Franklin D. Roosevelt applied first through his New Deal. Oliver Wendell Holmes, Jr. reportedly characterized Franklin D. Roosevelt as a second-class intellect but a first-class temperament (interestingly, Holmes may have been referring to some other Roosevelt). Holmes’s language has been influential. Many historical treatments describe FDR’s winning personality and impressive negotiating skills but claim the President was inadequately informed about economics. They criticize him for lacking a firm and clear idea of how to achieve economic recovery. Rauchway acknowledges FDR’s shortcomings, but his book nevertheless enhances our impression of Roosevelt’s intellect. 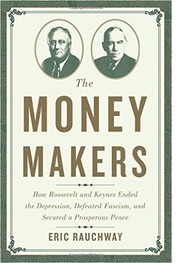 The Money Makers reveals that President Roosevelt appreciated the insights of John Maynard Keynes and put many of the economist’s ideas to work through bold public initiatives. FDR rejected the entreaties of influential businessmen and politicians who recommended the gold standard and other conservative approaches. The President maintained that Washington needed to serve millions of Americans, not just an elite group of bankers and industrialists who favored tight-money policies.